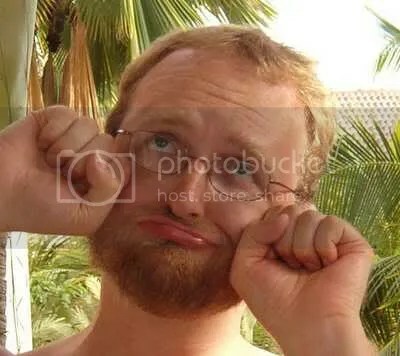 As a teacher in a hardscrabble inner-city neighborhood, I have recently become disgusted with a certain cliche that is robotically spouted from the lips of my more disaffected and unmotivated students. The offensive phrase in question is “It is what it is” and it sort of a reverse rallying cry for the swells of apathy and one-dimensional worldviews that have rotted tender minds before they’ve had a chance to evolve. No fewer than six students out of 78 seniors chose this call to surrender as their personal quote for the year book. I know that I am being a bit histrionic since each generation has chosen their own brand of bite-size nihilism to embrace as a call to arms. Instead, this one feels different since it is a call to surrender. It signals acceptance of a life that is static and unchanging instead of one that is ecstatic and unpredicatbly full of sublime moments that will never be summed up in a pithy phrase. 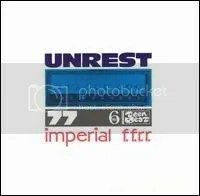 The contrast between the examined and unexamined life recently came into focus for me while listening to the eight-minute title track of Unrest’s Imperial f.f.f.r. There are certain songs and sounds that have pushed me to moments of catharsis, bliss, confusion, sadness and countless other shades of emotional states in between. There is something sublime and larger than the mortar and brick that surround us. It is larger than the accumulated minutia and detritus that threaten to avert our eyes from the larger themes and possible directions of our lives. I’d like to compile a laundry list of these musical moments, but it kind of feels like mental masturbation at the moment. However, this review is probably guilty of the same sin. Anyhow, “Imperial” is just so minimal, elegant and evokes a stream of recollections of those times when your next step in life is alternately exhilirating and frightening as well. It makes me believe in the gravitas of a simple chord progression, angelic harmony and lyrics that resonate in your own life. In fact, the opening notes of “Imperial” are so full of introspection and melancholy and the eventual addition of Mark Robinson’s awkward choirboy vocals is one of those instants where every coalesces and becomes a positively transcendent harmony. It is a song about dreaming about things vast and undefinable like love, life and where our respectives paths will lead next. I wish it was 80 minutes long instead of eight, but the reverberating echoes that bring it to a premature finish do provide a simply gorgeous end to this meditation. Unrest were always stylistic chameleons, so it is only fitting that the elegance of “Imperial” is quickly abandoned for the rapid-fire strumming of “Suki.” It’s a sunny ode to the early pangs of lust, but it pales in comparison to “Cherry Cream On” its hedonistic doppleganger. Where “Suki” focused on puppy love, “Cherry Cream On” is all about lusting after every single nook and cranny of your love interest. It’s bubblegum pop with a horny, hedonistic side that joyfully explores the raging hormones and awkward desires of your first sexual encounters. I always found their inclusion to be kind of a humorous contrast to the weighty subject material of the album. However, Unrest never stuck to one theme for too long. Considering the album contains an ode to American painter Isabel Bishop, meditations on the death of a father, clumsy hip-hop instrumentals and churning drones, the shifts and juxtapositions make sense when listening to the album as a whole. Although Imperial f.f.f.r was released sixteen years ago, it still sounds youthful, fresh and optimistic. It makes me just as wide-eyed and excited about life and love as it did throughout my youth. Just because life has slapped us around a few times doesn’t mean that there aren’t infinite possibilities for adventure and personal growth. Yes, it’s just an album. It is what it is, but much of this “it” has provided a well of inspiration and a aural canvas on which to project my own thoughts and dreams. I know I keep saying that each album is one of my favorites, but each album posted occupies a special place in my heart. Grenadine is no exception. The cover and artwork of the album is pure schtick. Its imagery predates the lounge revival which brought Martin Denny, Les Baxter and Esquivel back into circulation and the liner notes falsely claim the songs are Sinatra and Cole Porter tunes. 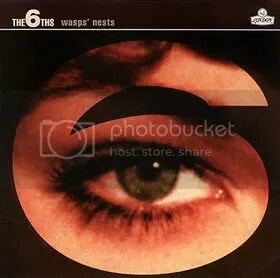 Thankfully, the band only gives passing nods to the easy listening of the 50s and 60s and reminds me more of Robinson’s angelic harmonies of the title track of his Imperial fffr album. 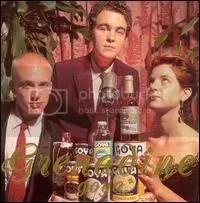 Consisting of Jenny Toomey of Tsunami, Mark Robinson of Unrest and Rob Christiansen of Eggs, Grenadine was a supergroup in a shaggy dog sort of way. At least, my lonesome sould thought so. Outside of moments on Unrest’s last albums, Goya contains the best performances any of these talented, but inconsistent artists ever recorded. Tsunami had a few great songs, but relied too heavily of Toomey’s husky, moody voice to carry lackluster tunes. Mark Robinson always had too many ideas and genres to explore. Eggs fell victim to the same miscues as well. Goya’s strength lies in the fact that the source material is already classic and their quirky sensibilities elevate instead of dilute the finished product. It doesn’t hurt that Toomey and Robinson possessed two of the most more interesting voices in 90s indie rock. Their voices never sounded so good as when covering “I Only Have Eyes For You” as Toomey belts it out in such a manner that it makes you take a second look at the song and realize the beauty of its lyrics. She transforms it into a moody meditation instead of blind-eyed devotion. I forgot how wonderful their cover was until reevaluating it for this review. It jangles like indie-pop, it sounds like indie-pop, but it transcends its littler corner and becomes something much more lasting. Mark Robinson follows up with a one-two punch as he sings “In a World Without Heroes” A good friend who was interested in astrology found this song to be romantic as the lyrics relate his ability to discern the meaning of her star signs and horoscope to find a common bond between them. He seems worries that he doesn’t truly know her, but shows confidence that love can be derived from this celestial moment. It is sweet and tender in the nerdiest way possible. It still arouses a bit of mist in the ol’ eyeballs.